← And so KCW begins! This has been a bit of a funny KCW. Things have been rather busy, and stinking hot. 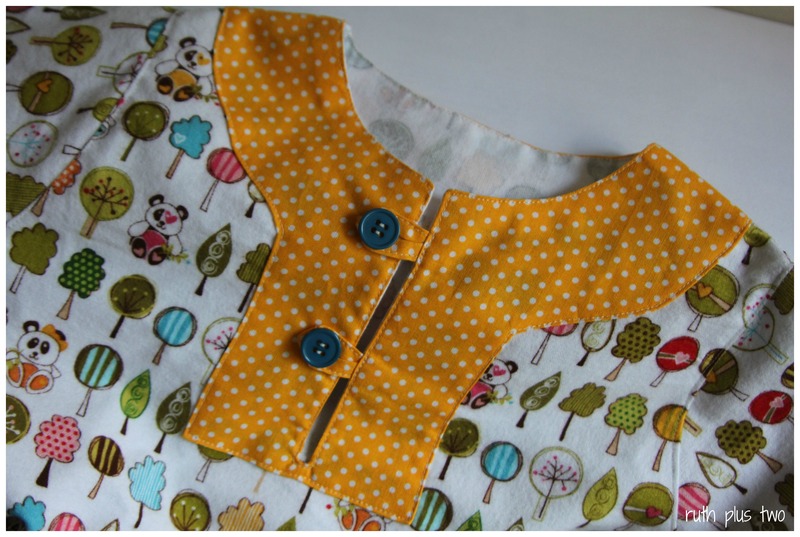 I’ve been sewing in the evenings – I’ve managed my one hour a day, but not much more! It feels like it’s all going rather slowly, but I think it’s just that I’ve been pretty tired. It didn’t help that I had a major disagreement with my overlocker on Sunday evening. We’re not talking a small lovers’ tiff here. It was major. I had to rethread the entire thing (which has to be my least favourite activity EVER – you need tweezers…) and not only that, something went wrong along the way rendering the whole machine useless. I was not best pleased. After tinkering with it over a few evenings, I did finally get it going again. And Alex rang on Wednesday and booked me in for an overlocker course in April. On his birthday. He’s so good to me. Elena’s been very keen on sewing recently. Whenever she disappears I can find her at my machine. Very cute, if not slightly alarming. I’ve taken to turning the power off at the wall! 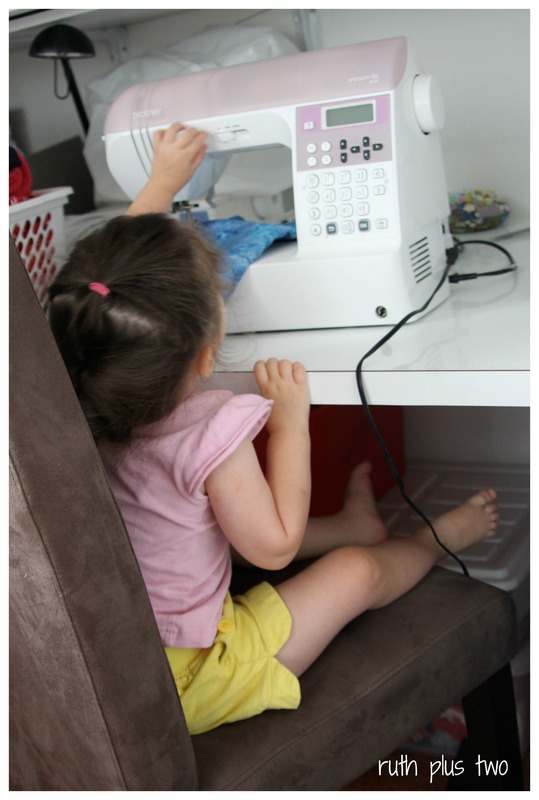 I did sneak some sewing in on Thursday morning, but I did have a toddler on my lap…You can guess how much we managed. The rest of Thursday was a write off. We’ve (finally) taken the side off Elena’s cot and she didn’t sleep. At. All. Of course, Hugo was disturbed by Elena’s fussing and didn’t have his afternoon nap. I ended up bundling everyone off to the shops for a baby cino and a trip to the library. But no sewing! Thankfully she’s since taken to the bed and we’ve not had many problems since. Despite the heat, I have been working on winter pajamas for Elena. She’s set for summer clothes, and I think we’ve got enough to get her through most of autumn too. It just seems like a waste to be sewing for now. We’re smack in the middle of summer at the moment, and Elena will be three mid-winter. She’s pretty small for her age, but I decided to sew size three for her. Hopefully she’ll get some wear out of them this winter – and perhaps even more again next winter when she’s four. 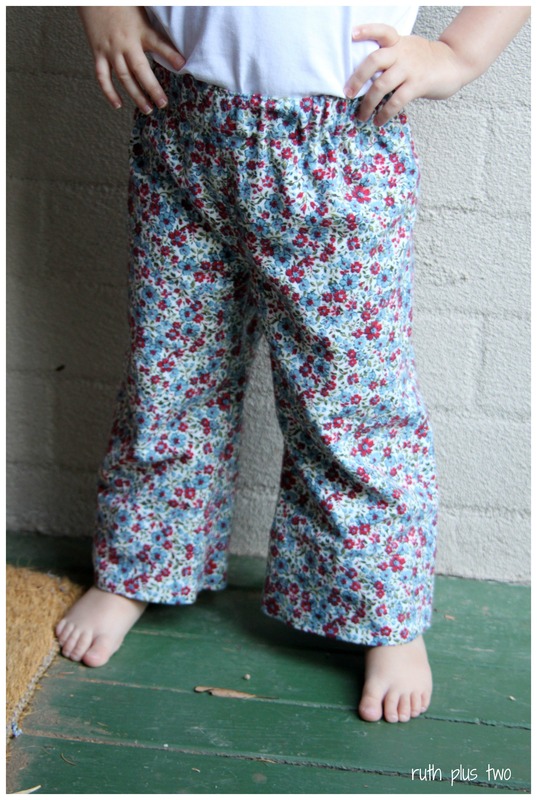 I’ve finished three items so far – two pairs of flannelette pajama pants, and one matching tunic top. All of the fabric is from my stash. The pants are Made By Rae’s Parsley Pants. Parsley Pants is a great, unisex pattern. There are stacks of variations (flat front, pintucks, pockets, knee pads, and tuxedo stripes) and it runs from size 2 through size 10. I made the most basic pants and they were super easy – there are only 4 steps! The legs of the pants were way too long for my little shorty, but instead of cutting them shorter I’ve just hemmed them up. I’ll let them down as Elena grows. There’s a little room in the waist too. I can replace the elastic as she grows too. The pajama top is another Made By Rae pattern, the Charlie Tunic. Also unisex, you can make it long or short sleeved. 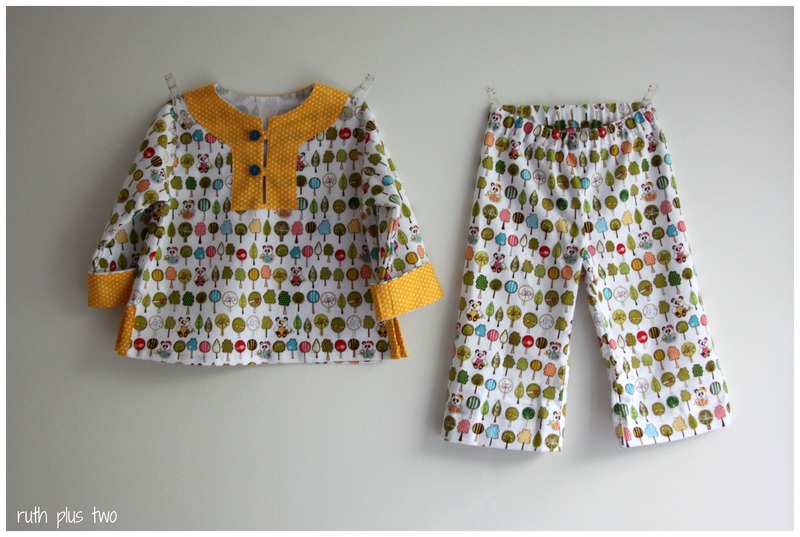 The pattern ranges from 12 months to 5T. There’s also a dress add-on that I purchased too. I think it would look super cute in corduroy with tights for winter. The tunic was easy enough to sew but I must admit I did wonder there, for a moment, if I’d ever get it finished! I could have left the side vents and sleeve facings off, but I think they’re really sweet so I stayed with it. To be honest, I think I was the problem – rather than the project or the pattern. It all came together very smoothly. 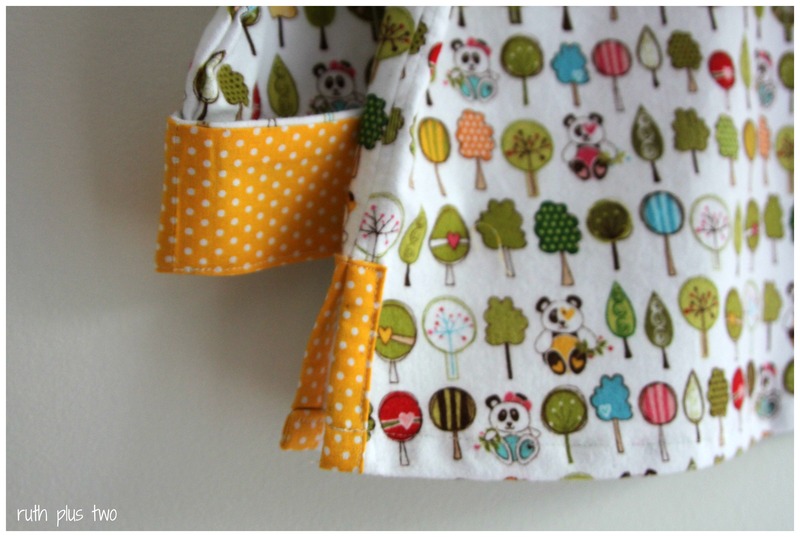 The sleeve facings are neat, but also mean you can turn the cuffs down for extra length when your child grows! The neck facing went on really easily. I had expected it to be a pain, given all the turns. I used Rae’s hidden button loop trick (on page 11 of the pattern) and it worked a charm. It’s been so hot that I’ve only got one photo from earlier in the week of the pants on Elena. I couldn’t bring myself to put the others on her. In non-sewing news, I received a yarn delivery this week (and a new swift, but more on that another day!) 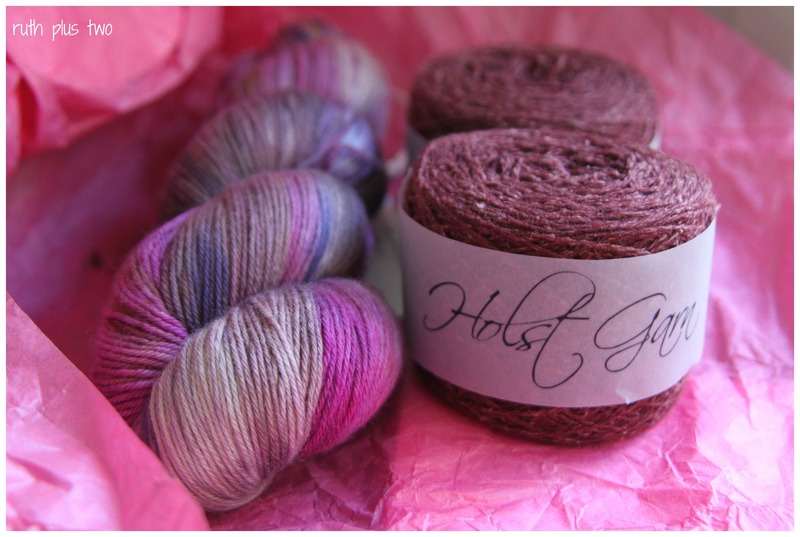 – some Skein Top Draw Sock yarn in fig, and two balls of Holst Garn Samarkand in deep garnet. I have shawl plans for the Holst Garn….I’m thinking of this pattern but I’m having last minute yarn-choice jitters. Any knitters out there care to confirm or assuage my worries? Will I live to regret an Echo Flower shawl in Samarkand? 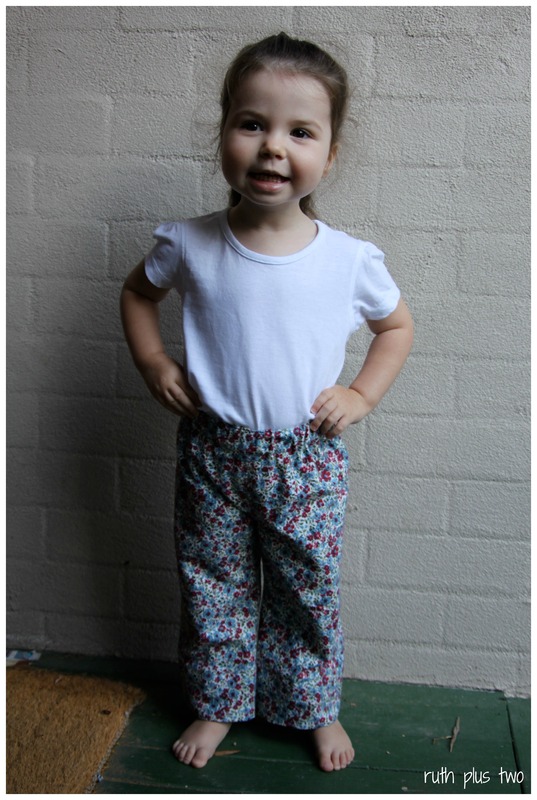 This entry was posted in clothes for children, Kid's Clothes Week, knitting, Made by Rae, sewing, stash, yarn. Bookmark the permalink. definitely keep an eye on her and your machine. My eldest around the same age, nicely cut through the lead to the presser foot. I was sitting pinning together a piece before sewing, when the machine started sewing magically. The advantage of that little brush with electrocution (ha ha), brother in law replaced lead with one much longer and I was able to sew at the breakfast bar comfortably. I have to pack my machine away every night (when using it). I unplug it but Finn has mastered how to plug things back into the wall. Not terribly well – only half in. Enough to give power to the machine and to electrocute himself I am sure. Thankfully none of that yet. My two have a fascination with my machines too. I saw a (non working) Barbie sewing machine in Target, which could be a distraction? Love the PJs, BTW. I might have to consider something like that. I have to be more careful, too. Just the morning after I posted this, I found her sitting at my machine, with my scissors, cutting into a brand new t-shirt. Hmmm.